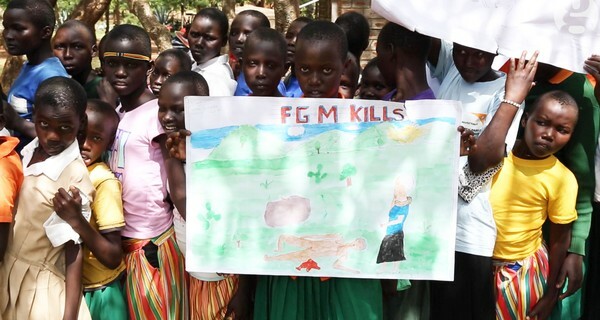 Female Genital Mutilation (FGM) is the surgical removal of all or part of the external female genitalia, and a terrible violation of the human rights of women and girls. The procedure, which is done for non-medical reasons and is not specific to any one religion or culture, is horrifically painful and leads to complications for the rest of the woman’s life. The UN has pledged to work towards the total abolition of FGM, and this is no small undertaking: it is estimated that 80 million girls will be subjected to this torture between now and 2030. The Guardian newspaper’s campaign to end FGM has unified the voices of activists around the world, under the hashtag #endFGM. The hashtag is a simple but powerful way of linking campaigners from various organisations with one another, but also with journalists, pressure groups, politicians, victims of FGM and the public. The campaign’s page on the Guardian website is a platform that collates all news articles about FGM as well as videos, comment pieces and information on the unnecessary, unsafe and inhuman practice. Two tireless campaigners whose work has been championed and amplified by the Guardian are British schoolgirl Fahma Mohamed, and Gambian activist and FGM victim Jaha Dukureh. 17-year-old Mohamed’s petition to have FGM talked about in schools in order to make education central to the ending of mutilation was signed by over 250,000 people and received the support of the UN’s Ban-Ki-Moon and Nobel Peace Prize winner Malala Yousafzai. Dukureh’s petition demanding proper research on FGM in the USA was also a success: the Obama administration has agreed to conduct a study into the issue and its prevalence in the USA. Follow @GdnEndFGM on Twitter and use the hashtag to add your voice to the campaign.